A CloudMan cluster can be used for different scenarios, including a comprehensive bioinformatics workbench for a lab, a platform for doing hands-on classroom training or for tool development and testing. In response, a number of CloudMan cluster configuration types exist for you to choose from, depending on what you would like to use the cluster for, as captured in the following screenshots. Note that you choose the cluster type only once (in either the Cloud Launch application or CloudMan itself) and it's done when you first create your cluster. This type will create a virtual and dynamically scalable cluster-in-the-cloud. CloudMan will configure a job queuing engine Slurm along with the a shared NFS directory (under /mnt/galaxy; see Storage options below about the size). The size of the cluster is managed via CloudMan's graphical web interface. 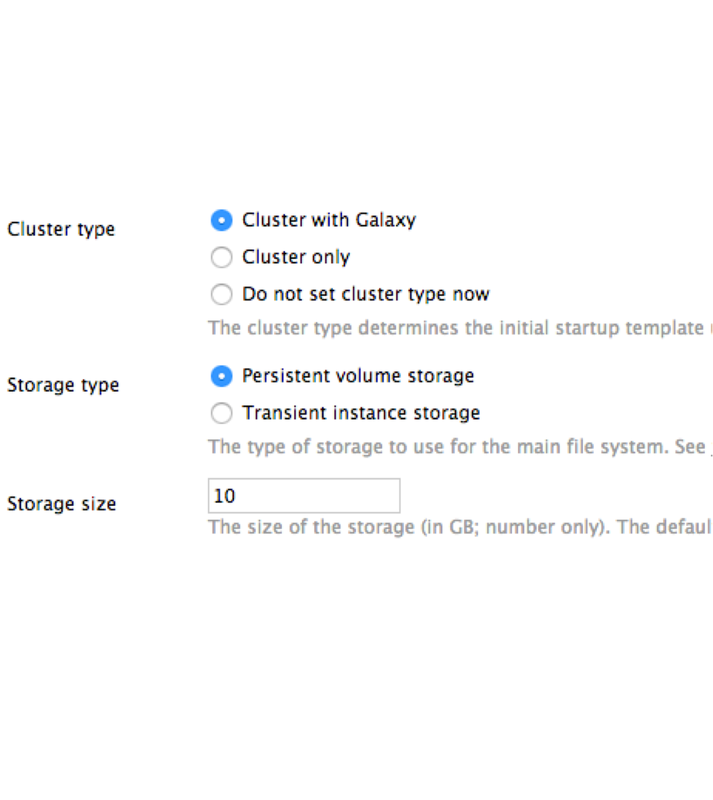 This cluster type will configure all the same functionality as the Cluster only type with the addition of the Galaxy application ecosystem. Namely, this cluster type will automatically configure the Galaxy application in production mode and supply the necessary cloud infrastructure for processing the tasks. The Galaxy application comes preconfigured with hundreds of bioinformatics tools (for the complete list, see this file) and hundreds of gigabytes of genomic reference data. If someone shares a cluster with you or makes it public, this option allows you to create a clone of their cluster under your account and control. Once cloned, the derived cluster will have all the same configurations, data and applications running as the initial shared cluster. In order to clone a shared cluster, you need to know the Share string of the shared cluster, which will look something like this: cm-0011923649e9271f17c4f83ba6846db0/shared/2013-07-01--21-00. To create a cloned cluster, launch a new CloudMan instance and paste the Share string in the appropriate field on the initial CloudMan cluster type configuration dialogue. The same set of services that were running on the shared cluster. Selecting this option in the Cloud Launch interface will not pre-select the CloudMan cluster type and instead you will have a choice of choosing the cluster type within the CloudMan application once it has launched. This type of storage is used when you need large amounts of storage or when you want to be able to terminate and relaunch your cluster. When choosing this type of storage, you can set the desired size in the range from 10GB (1GB for the Cluster only type) to 16,000GB. This option uses persistent block level storage volumes (e.g., AWS EBS) that exists independent of the virtual machine using it and, as a result, it provides resilience against virtual machine failures. Note that in the case of commercial clouds, the use of this type of storage incurs additional costs. Most of the cloud virtual machines (or instances) have a certain amount of storage available to them by default. This storage type is available for free and cannot be changed in size (the amount of available storage depends on the instance type). However, this storage is available only while an instance is running and once terminated, the storage is irrecoverably lost. This type of storage is most useful for temporary clusters during testing or tool development.